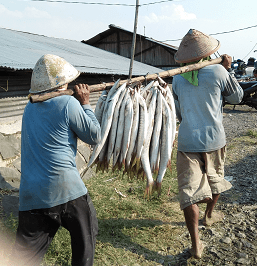 The agriculture, forestry, plantation, and marine fisheries sectors provide livelihoods for a significant fraction of the Indonesian population, yet contribute less than one out of every ten dollars of revenue received by provincial and national governments. In many resource-rich regions, poverty rates are high and local residents receive little or no benefit from the exploitation of the country’s abundant natural wealth. With support from the International Budget Partnership, two Indonesian civil society organizations – Perkumpulan Inisiatif and Seknas FITRA – both with a strong background in budget analysis and advocacy – set out to understand the reasons why these sectors generate so little revenue and to develop strategies for improving governance and ensuring that local communities receive an appropriate share of the benefits from economic activity in these sectors. The four sectors addressed by this project – agriculture, fisheries, forests, and plantations – accounted for 13.5 percent of the Indonesia’s gross domestic product in 2015. The contribution of these sectors to public budgets through tax and non-tax revenues, however, lags their contribution to Indonesia’s economy. This project focused on the gap between the importance of each of these sectors to the Indonesian economy and the livelihoods of Indonesian families and the sectors’ revenue generating potential.